He is a native of Miami, Florida. He was a 1950 graduate of Georgia Washington Carver High School and from Atlanta’s Morris Brown College in 1957. After having his education interrupted for military service, the Army during 1953-1955, he was employed by the Waycross Board of Education from 1957 until his retirement in 1987. He served as head football coach at Waycross Center High School from 1957 to 1968. He won the state Championship in 1962. 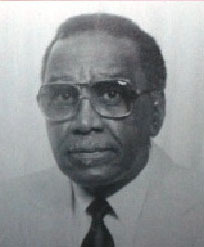 During this period 1968 – 1973, he was a member of the Waycross High school faculty. He returned to then Center Junior High School from 1973 to retirement in 1987 as Coach and Athletic Director. His Center Junior High basketball team won the junior high school State Championship in 1977. Coach Saunders married the former Miss Mary Croom of Waycross. They had two sons, Leon and Harold. He was a member of Big Bethel Free Will Baptist Church and served on the Board of Trustees.